Nuclear division is a sequence of events takes place in a cell. There are 2 types of nuclear divisions as mitosis and meiosis. 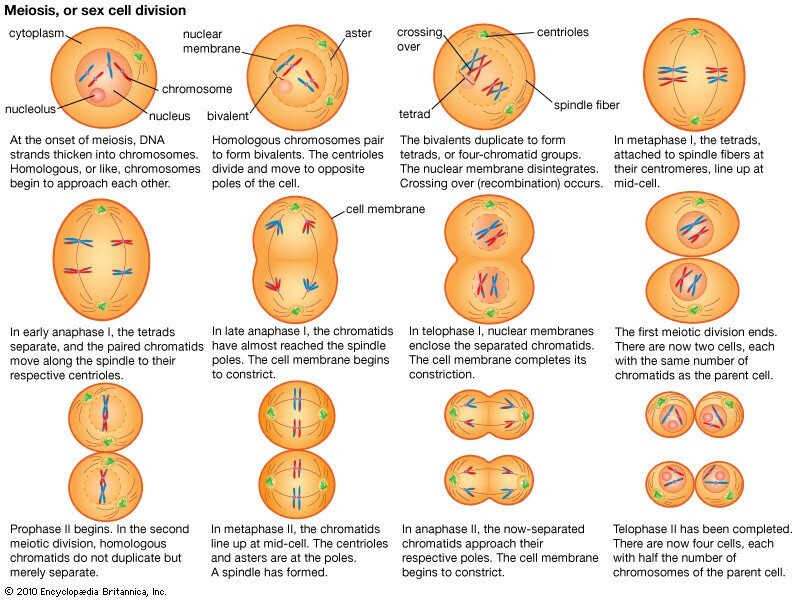 Mitosis is the form of nuclear division in which mother nucleus divides into 2 daughter nucleus which are identical to each other and to the mother nucleus and can occur in diploid, haploid and polyploidy cells where meiosis is the form of nuclear division in which chromosome number is halved from a diploid number to a haploid number (Harley, 2013) (Figure 1). 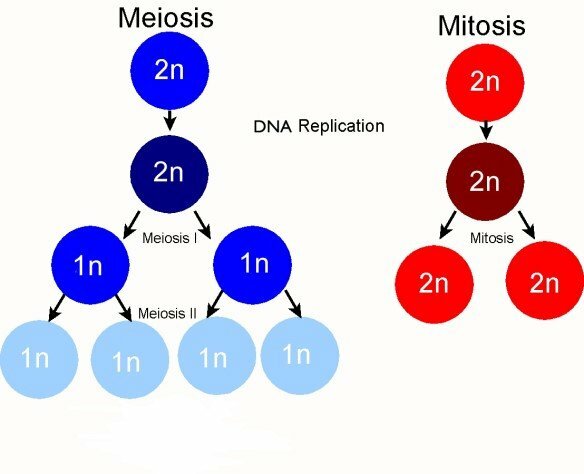 In meiosis, there are 2 consecutive divisions as meiosis 1 in which the segregation of homologous chromosomes occurs and meiosis 2 in which segregation of each chromosome into chromatids occur. There are several phases (Figure 2). Longest phase is Interphase and there are 3 sub-phases as G1 phase in which the cellular growth occurs by synthesis of cellular substances increasing metabolic rate, S phase in which doubling the amount of DNA by replication and G2 phase in which cellular organelles are synthesized and ATP is produced and stored. In meiosis 2 Interphase may or may not occur. The second main phase is M phase which has 2 stages as nuclear division and cytoplasmic division. The nuclear division consists of Prophase, Metaphase, Anaphase and Telophase. During prophase, chromatin threads are shortened and thickened forming homologous chromosomes. Homologous chromosomes are tightly paired up forming synaptonemal complexes by Synapsis (Figure 3). 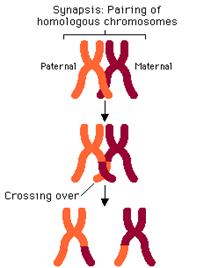 Paired up 2 homologous chromosomes appear as a single thread known as a Bivalent (tetrad).These recombinant chromosomes are then separated forming Chiasma/ta in which the exchange of genes take place (Figure 4). This process is known as Crossing Over (Figure 5). Nucleolus and nuclear envelope disintegrate. Centrioles migrate to 2 opposite poles and microtubules organized into spindle and aster. In metaphase, each homologous chromosome is attached to the spindle and is lined up at the equator. 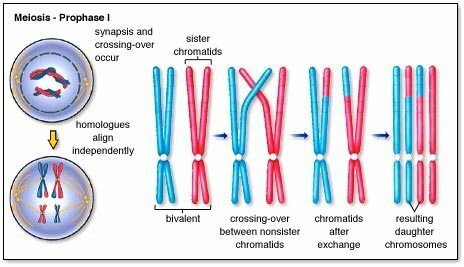 Due to this orientation of homologous chromosomes are random. This ensures the Independent assortment of chromosomes. Contraction of spindle fiberes causes the breakage of chiasma and chromosomes move into two opposite poles in Anaphase. The two sets of chromosomes are then surrounded by nuclear envelope and two nuclei are formed respectively in Telophase. Cytoplasmic division takes place by formation of cleavage furrow (Hillers, 2015; PMG Biology, 2015; Alberts, 2002). Crossing over forms chromosomes with new gene combinations allowing the reunion of maternal and paternal genes. This forms recombinant chromosomes with new gene compositions. Homologous chromosome pairing, formation of recombinant chromosomes, stoppage of segregation of sister chromatids in meiosis 1 and non-attendance of replication of chromosomes contribute to increase gamete diversity but keeping the chromosome number constant. Random orientation of homologous chromosomes in metaphase 1 completely independent, so that chromosomes of a homologous pair can assort with another chromosome of another pair. These increase the gamete diversity leading to mutations (Hillers, 2015; Walen, 2010). Mitosis maintains genetic stability by duplicating parental cells. This helps cell replacement regeneration of body parts. During the DNA replication of mitosis mutations can be occurred (Seattlepi, 2016). So that mitosis helps genetic variations through mutations cause by DNA replication whereas meiosis facilitates genetic variations in multicellular organisms by playing an important role. Alberts, B., Johnson, A., Lewis, J., Raff, M., Roberts, K. and Walter, P. (2002) Molecular Biology of the Cell. 4th edn. New York: Garland Science. Samadhi is a contributor at Nerdynaut Staff.